Ming consort tomb #5 has on the one hand retained many of its original structures, but has, on the other hand, almost been completely consumed by a local village. 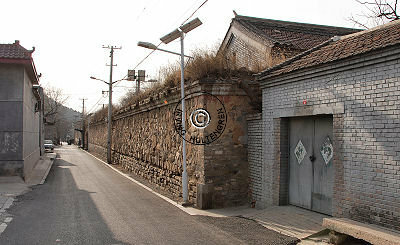 The mausoleum is located in the center of the small village of Wanniang Fei Cun, at the exact point where the through fare and main street meet. The occupant is known and will be revealed at the end of this page. The mausoleum is fairly easy to spot since the entire perimeter wall and the original main entrance are still intact and very conspicuous even to the casual passerby. The photo (top right) is what you see when you drive to the end of main street of the village -not the banner, of course. The tomb has three main sections; the lower central part, which originally contained the ceremonial hall, the two side sections -purpose of which is unknown and the burial section, which contains the stele, the screen wall and the tomb mound, followed by a steep incline up to the back part of the surrounding wall (#10). Access to this mausoleum passed through the front gate (#7) or one of its side gates (#8). Tomb number 5 has a very distinct inner wall (#6 and #11 on the layout). Sheltered by the wall was either one large or two small halls, judging from the few, still extant plinths (#5). The tomb precinct still has a restored stele (#2) positioned behind a screen wall (#3). Behind the stele lies the remains of the tomb mound (#1). The rear section contains no particular structures. Its role is merely to seal of the mausoleum and protect the tomb occupant. Most of the front gate (#7) has survived the onslaught of time and man. 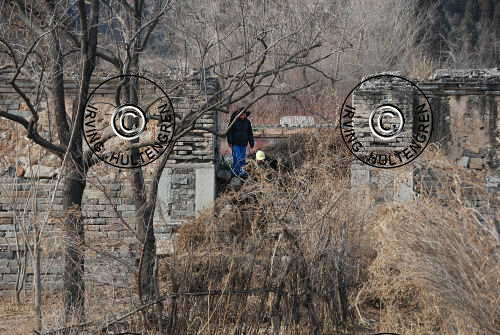 Both the two side pillars and the crossbar are extant and only somewhat dilapidated. Some of the original colored tile decorations even remain in place at part of the crossbar. The entrance doors are long gone. Today, anyone can walk right through the gate and into the mausoleum. 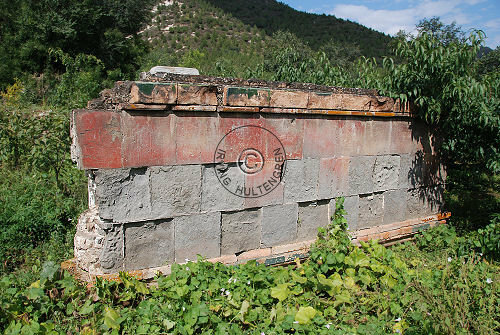 The side foundations were decorated -presumably with green colored tiles- but by now only the somewhat larger bases remain. Inside the gate is however not the serene and tranquil tomb one would expect to find. 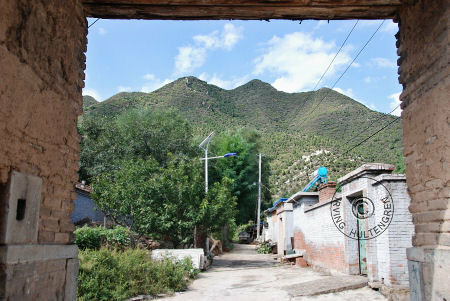 Instead, the area is littered with paved, narrow roads, one story dwellings and various garbage. In contrast to the other consort tombs, tomb #5 had two side gates (photo), equidistant from the main gate. The remains of the side gates (#8) are still clearly visible from inside the tomb area, but the openings have been filled with brick and rock and the side gates are thus no longer used. The original wooden material and top tiles can still be found in both the main gate as well as in the top sections of the two side gates. The outer wall is in an incredible good condition. Many sections have obviously been restored in several turns, which only adds to the overall good impression. The villagers living inside the mausoleum have a personal vested interest in ensuring that the perimeter wall remains intact. It is not possible to walk the entire perimeter. 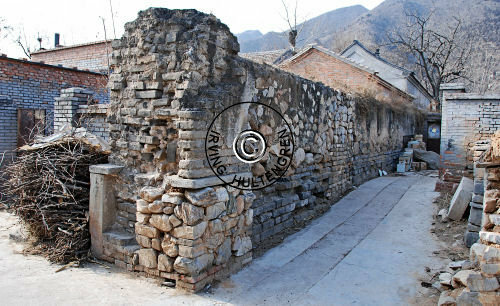 Whereas the front and "left" walls can be accessed, the "right" wall has been completely encapsulated by the village. This tomb has well preserved inner walls (#6 and #11), which surround the large center area, which used to contain memorial hall(s). 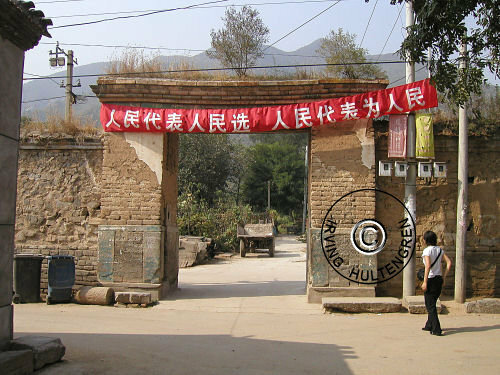 The area is now completely taken over by the local villagers and the "left" and "right" inner walls have to a large extent been incorporated into the village houses and courtyard walls. The entire "right" section between the inner- and outer wall is virtually inaccessible as it has been entombed by the villagers' own courtyards. Visitors have more luck with the "left" inner wall, with a large section extant and visible at the "south" end of the mausoleum, close to the inside of the front perimeter wall. Interestingly, access to the areas between the inner-and outer walls was controlled with separate gates spanning the space between the "south" end of the inner wall and the outer wall (see photo). None of the other consort tombs show any signs or remnants of having such additional gates inside the mausoleum proper. 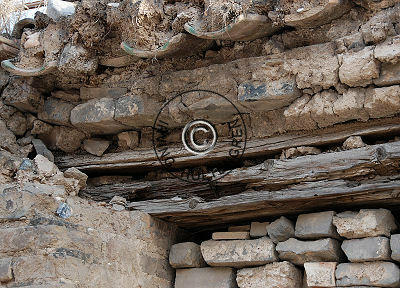 The rear inner wall was equipped with a gate, which gave access to the burial precinct. The gate is in better condition than those in the front, although the doors have long since disappeared. The rear inner wall is taller than its sisters on both sides. Most of the area enclosed by the inner walls is laid out as dwellings or vegetable gardens. Fortunately, the 'sacred path' has survived man's intrusion. 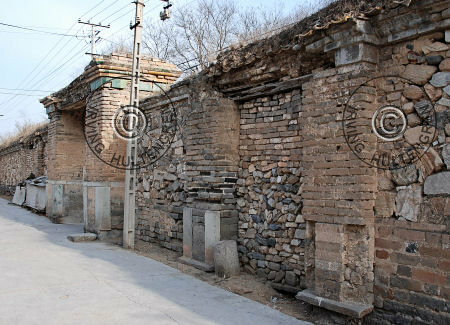 It is however not a path laid with fine marble stones as one can find in all the imperial Emperor mausoleums, but merely a paved path leading into the tomb proper. Once past the buildings and all the rubble in the front you enter the area, where the ceremonial hall(s) used to be. There is nothing left of the hall or halls apart from a number of plinths and some stone pieces scattered around here and there. It is hard to determine from the number of plinths found here whether there was one or two halls, but if it was only one, then it was quite large. The plinths have been placed on top of the ground so as to indicate two independent buildings, one on either side of the center line -the 'Sacred Way'. Some of the plinths have by the farmers conveniently been moved up against the "right" inner wall, obviously not where they were originally intended to be. Plinths were originally incorporated into the foundation of the building(s) and served as base for the wooden columns, which supported the roof structure. The columns have long since rotted away. The walls of the halls were placed almost like panels between the wooden columns -a construction very different from that traditionally used in the West. A screen wall has been erected some 5-6 meters behind the gate between the ceremonial section and the burial section. Its role was to prevent prying eyes from disturbing the deceased as well as to prevent evil spirits from entering the tomb. The wall is 2.5 meters tall. Its main surfaces are covered with large, square vermillion colored tiles without decoration. Most of the tiles have fallen off and been removed. On top and bottom of the center wall is a layer of large, rectangular, plates glazed in imperial yellow. This color indicates that the tomb occupant must have had a high rank and of imperial lineage. The top section has larger, decorative, green glazed brick, although the glazing has mostly fallen off. The "roof" tiles on top of these brick have all disappeared. A memorial marble stele stands some two meters behind the screen wall. 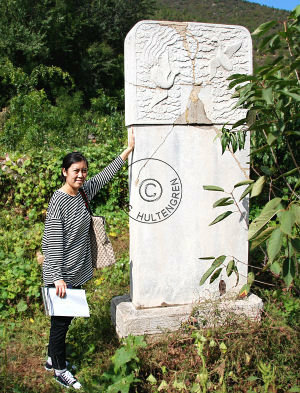 The stele itself is about three meters tall. 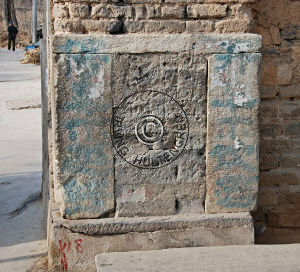 The stele has been broken but restored back to its original state. It has no inscriptions as was customary at the time. Two phoenixes are engraved in the top section evidencing that the tomb occupant is a female. 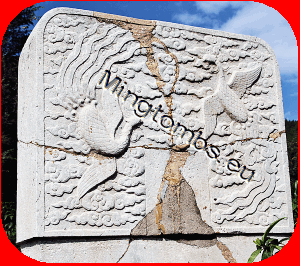 The stele base also has phoenixes engraved in the front and the back. They remain in good condition despite their 4-500 years of age. The remnants of the tomb mound is located some 10 meters behind the memorial stele. 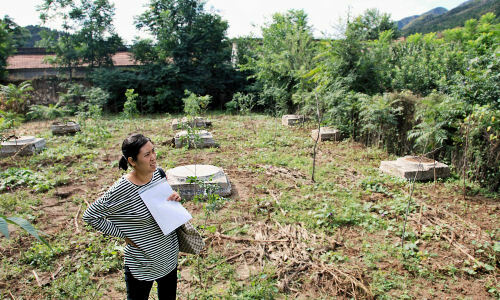 The location is far from any of the imperial tombs containing Ming Emperors, but still within the spirited Shisanling necropolis. Although rather grand for a concubine this could not be the tomb of an empress as she would traditionally be interred together with her husband and emperor. The tomb on the other hand likely contains a female of imperial lineage or of a very high status, evidenced by the stele engravings, the size of the mausoleum and the (one or two) ceremonial hall(s). This is the final resting place of Lady Wan Shen'er, formally known as Imperial Noble Consort to the Chenghua emperor (r. 1465-87). The title of Imperial Noble Consort, which could only be bestowed to one woman at any time, ranked directly below Empress, the highest rank in the Ming dynasty. Born 1428 and thus twice his age, Lady Wan (better known as Wan Guifei meaning consort (offspring of) Wan Gui, her father) was almost like a mother figure for the young and mild mannered Zhu Jianshen, later the Chenghua emperor. He relied heavily upon her for moral and emotional support during his upbringing with his father first being captured by the Mongols and later virtually imprisoned in The Forbidden City by young Zhu Jianshen's uncle, the Jingtai emperor (r. 1450-56). Wan Guifei took advantage of her privileged position and soon saw her opportunity to become a lover and favorite concubine of Zhu Jianshen, when he was enthroned as the Chenghua emperor 28th February, 1464. In the same year she successfully gave birth to a son, but her luck ran out when the boy passed away unnamed shortly after birth. Wan Guifei spent the rest of her life plundering the empire and preventing the emperor from having another heir. Aided by her accomplices she achieved this by inducing abortion to pregnant concubines or poisoning mother and child after birth. History however records that her sinister actions and evil intents failed inasmuch as one concubine in 1470 gave birth to- and hid a son unbeknownst to Wan Guifei. This boy later ascended the imperial throne as the Hongzhi emperor (r. 1488-1505). Wan Shen'er aka. Wan Guifei or Lady Wan passed away 1487, 58 years old.